The Domestication project is a project in which we chose a animal or something like it to study and do research on. So far in my project I've learned that lots of people don't really understand dogs. 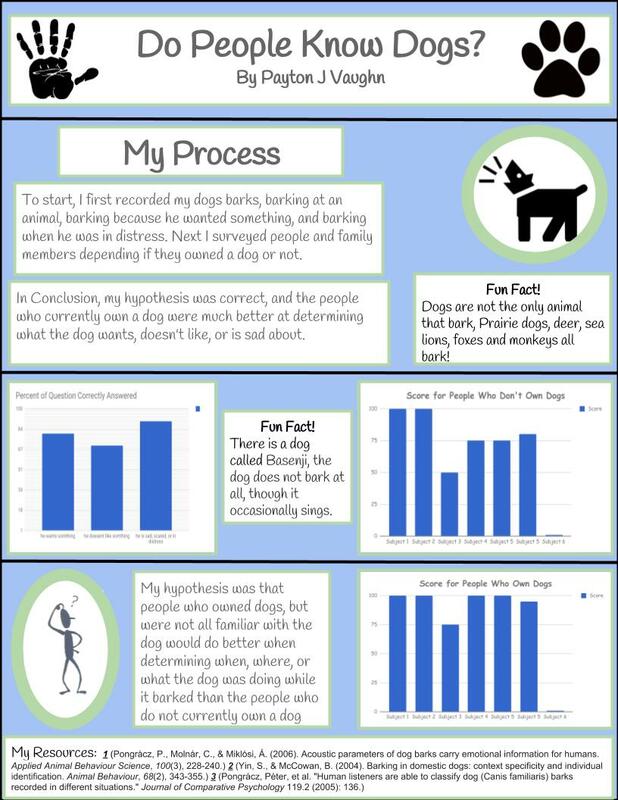 For my project I decided to go with seeing how well do people actually know what dogs are doing or wanting when they bark. So my hypothesis was "people who currently own dogs, but don't directly know the dog will do better then people who don't know or own a dog at all." I decided to pick this because for a while my parents have always thought what does my dog want when he barks, "why is he always barking?" they would exclaim. So thus I thought if other people actually know dogs that well, so thus was born my project. To start off my project I took a group of 10 family members, 5 of which own dogs, but don't directly know the dogs, and also 5 people who don't know or own a dog at all. Next I recorded my dog in three different situations, first when he wanted something. I collected his bark by holding a treat in front of his face. The second situation was when he was feeling aggressive like when he was barking at deer or a fox. The final situation I recorded him barking while he was in distress, I collected his bark by locking him in my room. Next I tested all of my family members, and got some spurring data, the people who did not own a dog, did surprisingly worse than I though they would. Around 30% worse on average. That result was extremely surprising!